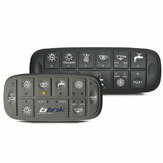 From boating to the mainland, here is the CAN keypad summarizing the Blink Marine evolution. Thanks to the collaboration with Digital Switching Systems, this CAN-bus keypad is one of the most advanced applications of the know-how Blink born from nautical and applied to agriculture and building. 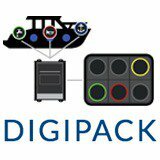 An interview with Gabriele Stefanini, Blink Marine‘s technical manager as featured in italian magazine Macchine Edili (italian pdf) about the CANopen keypad Powerkey Pro. 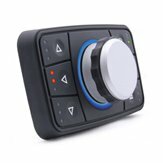 The PowerKey Pro (PKP), a digital CANopen keypad designed and developed by Blink Marine together with American partner Digital Switching Systems, is debuting in the market for agricultural and construction machines, after having earned accolades from ship and yacht owners all over the world. We met with Blink Marine’s technical director Gabriele Stefanini, who oversaw the delicate move from the nautical sector into general machinery. This step required a great deal of time and effort from Blink Marine’s technical department, and has now given the company a chance to test its product with Samoter. A crane is significantly different from a motorboat. Can you point out anything they have in common? What doesn’t the IP67 cover? The IP67 certificate covers resistance to the infiltration of water and solid bodies – and from this point of view I have to underline the fact that there is no more evolved product on the market than the PowerKey Pro – but it can also boast other characteristics that are at least as important, like the fact that it can work for a long time even in extreme temperatures (for example 24 hours at -40° or +85° C) and is resistant to chemical agents… All additional aspects in which the PKP excels. What other aspects interested the people you spoke with? While the first question was always about robustness, I’d have to say the second question was almost always about versatility, and this is another area in which Blink Marine matured plenty of experience while working in the nautical sector. We often have to deal with extremely specialized production realities in the nautical sector, where people create complex, expensive machinery with no more than a handful of display products built per year. For these kinds of companies, we can offer a keypad that can be transformed into an infinite number of variations for next to nothing. When we started working with our American partners at Digital Switching Systems, studying the new product, we wondered if there wasn’t some way of fixing a problem that our clients were bringing up all the time. When somebody builds a boat, they’re usually able to “tailor fit” the final product to a wide range of client requests. This can often present a problem for purchasing keypads, since the custom requests are connected with a very small range of products, and often they were forced to purchase more keypads than they really needed just so that they could get the product they wanted on the boat they were building. To make matters worse, any request that fell outside the “standard” implied extra costs (for the client) and extra time (for us), both of which almost always appeared out of proportion with what were often minor modifications. With the PKP, we wanted to put all these issues behind us. That’s why we created a system with removable inserts that make it possible to substitute any single button at any time. This way there is no single standard: the configuration of each individual keypad can be changed at any time without having to substitute the entire product. We already have more than 200 different inserts available, and we can create additional, new inserts at cost. We made an audacious decision for MOQs too, and it’s paying off in spades: there is no minimum order quantity for the PKP. We’ll even accept an order for a single piece. Given the efforts we put into reaching out to clients who need top quality even for just a small number of pieces, it would have been a contradiction in terms to do anything else. 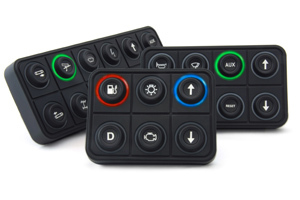 Making your digital keypad ready for the automotive sector took a great deal of time. What were the most difficult technological challenges you had to face? We had to adapt our keypad to all the most common standards used for commercial vehicles. 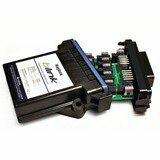 The first were the CAN J1939 and NMEA2000 protocols, the most commonly used in the US. After that we had to handle requests from European producers and installers, extending its range to include the CAN Open protocols. What else is in store for Blink Marine? We are just about to announce a new product in the digital keypads PKP family: the PKP 1400. It was designed for the lifting market, and is distinguished from the 2200 by the fact that the four buttons are in line, rather than set up two by two. We’re also adding blue as one of our standard LED light options. 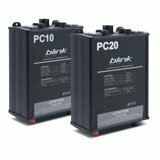 Last but not least, we’re developing several new products that will join our keypad, completing Blink’s product offerings: new user interface models, as well as power management solutions for electric loads. Our aim is to make it possible for clients to rely on Blink not only for keypads, but for their entire onboard systems as well.